Caravan industry leaders in East Yorkshire are welcoming the news that the government has changed its tax plans for static caravans. 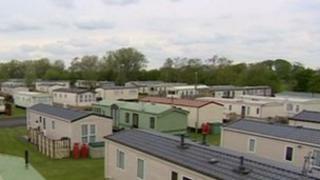 One caravan park owner described the change as "really good news and a victory for democracy". The new 5% rate will be delayed from October to April next year. Chancellor George Osborne announced the introduction of the 20% tax in the Budget in March. At the time, the government said it was bringing static caravans into line with mobile ones, which are subject to 20% VAT. The industry trade body, the National Caravan Council (NCC), claimed the tax rise would lead to 4,340 job losses at holiday parks across the UK, with a further 1,446 jobs lost in the manufacturing sector and 1,500 at suppliers. According to the NCC, 90% of all caravans are manufactured in East Yorkshire. Local MPs ran a campaign against the rise, including a vote against the measure in parliament and they presented a motion in the House of Commons signed by 70 MPs. The Conservative MP for Haltemprice and Howden, David Davis, described the climb down as a "great victory for the people who opposed the 20% policy". "It's common sense," he said. "It will actually save money at the end of the day. The previous proposal would have cost thousands of jobs. "With a bit of luck and good management this shouldn't cost any jobs. So it's a very good outcome." Guy Sparkes, the managing director of Patrington Haven caravan park in East Yorkshire, said: "It shows the government has listened to all the warnings and predictions that the industry has put forward. "I think we would've had lots of job losses within our industry and the local areas, they would have had a knock on effect."